If you are a mobile user, chances are, you often receive push notifications. And if you are in the business of Apps, then you know how essential push notifications are for marketing. Push notification becoming popular in Desktop medium also. This Spypush review will take you to the entire push ads world. Push notifications are special messages that periodically appear on your mobile device. They originate from certain Apps but can show up at any time even when the user is not on the App. Push notifications may resemble SMS messages at first glance. But when you open a push notification, it leads you to the App rather than the SMS platform. To convey convenient facts like breaking news and sports scores. Remind you about important appointments like flight info, take off time, and check-in times. Chime in crucial offing like traffic reports and the weather forecast. Conveniently bridging the gap between two Apps by use of a pop-up drop-down menu. Sending receipts immediately after transactions are done. Encouraging customer reviews and sharing on social media platforms. It is no secret that push notifications have become indispensable as far as online App marketing is concerned. In fact, push notifications to receive twice as much CTR as emails do. Such a strong marketing tool with so much personal reach needs an equally robust monitoring tool. Until now, there was no way to monitor push notifications in order to make informed decisions on what works and what doesn’t. That is, until SpyPush. SpyPush is a relatively new tool and the only one of its kind. In this Review, we will explore what SpyPush really is and why you should consider using it. First, access over 200,000 Ads spanning over 100 countries. You are able to see the kind of landing pages and creative Ads your competitors are running plus the span of time their Ads have been running. Second, you do not even need to reinvent the wheel when creating your own banner. Just pick and choose ideas from tried and tested Ad creations to build your own Ad in a few clicks. Third, you get to use marketing tunnels that have been refined over time by conglomerates with thousands of dollars to spend on marketing. All you need to do is hitch their bandwagon and sail through their marketing tunnels collecting clicks and conversions as you go. Fourth, enjoy traffic funneling from 6 giant traffic pools including Propeller Ads. SpyPush says they are working on adding all the remaining push notification Ad Networks to their list. Fifth, there’s a free trial! Check out SpyPush services free. For 24 hours, you will have unlimited access to 5 countries namely Germany, France, Vietnam, Indonesia, and Thailand. This is plenty of time to learn how SpyPush works and how it will be useful to your business. Also Read How to 10X Your Shopify Revenue Today! Why these push notification Ad Networks? Because they consistently supply fresh traffic. We are all aware that repeat traffic is dangerous because it inevitably leads to declining CTR. Conversions drop and so does your income. Consequently, you need an unending funnelling of new traffic to avoid the typical traffic burnout. Additionally, these traffic pools are forever dynamic in working different angles of marketing Ads, creatives, and test offers from various affiliate sites. This is how they attract new traffic and keep their numbers up. Online SpyPush Reviews indicate great results from using Propeller Ads. Ultimately, the traffic you will access through SpyPush is bot free, largely fresh, and fairly affordable. If you are lucky you may even get a SpyPush Coupon Code for 15% off! We already mentioned access to competitor’s landing pages and creatives. Some SpyPush Reviews indicate, however, that the landing pages are not available for download. SpyPush says they are working on making this feature possible but meanwhile, you can only copy what they do but not actually download the landing page. We, do love that SpyPush indicates the most successful banners and how long they’ve been up. This is important in staying up to date with the latest designs and creatives that actually attract clicks and consequent conversions. You may notice that some funnels and landing pages are difficult to view. This, SpyPush says, is because some landing pages run their own spy protection. Also, companies do not like to share their funnelling channels. But with a few tweaks of the SpyPush algorithm, you will be able to see these landers and funnels. 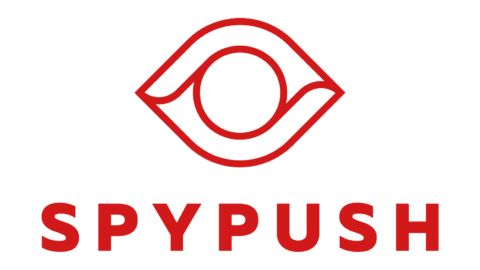 SpyPush has a highly motivated team behind it. Wherefore, you will often notice new filters, additional features, and tweaks in the algorithm. This is a good thing because it means the creators of SpyPush are always working behind the scenes to make SpyPush the best spy tool in the market. What monetization App does SpyPush Use? Initially, SpyPush only had Monetizit as their monetization App. This, they said, is because Monetizit has the highest eCPM and a simple, intuitive, user interface. Currently, SpyPush uses Clickdealer, Lospollos, and Cpamatica monetization Apps in addition to Monetizit. 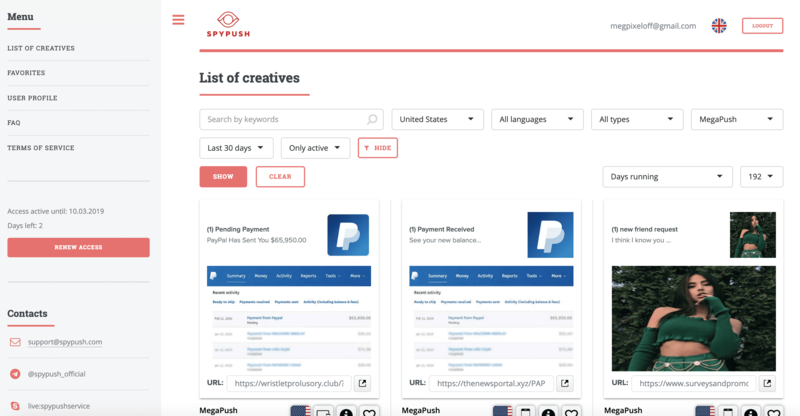 SpyPush costs $49 per month. This price, according to various SpyPush Reviews is quite cheap. As a bonus, you can get a 15% off SpyPush Coupon Code Here. Why you should use SpyPush Spy Tool? SpyPush supports the largest number of Push Notification Ad Networks in the market. It is the only tool of its kind and numerous SpyPush Reviews online indicate positive results and an upsurge of customers. Makes the creation of Ads and banners as simple as a few clicks. Cheaper than most of the other spy tools in the market. Be on the lookout for SpyPush Coupon Codes for 15% off! Offers a free trial period so you can test their services and make an informed decision. It is quite basic and easy to use. Ultimately, the science of using traffic pools to access impressions and consequent conversions is ever dynamic. This is the first revolutionary tool meant to demystify the murky waters of banner Ads and provide an easy to use strategy so you, too, can make money through your Ads.